We filleted it last night for dinner and oh my -- it was absolutely the best haddock I have ever had! This is going to be a wonderful thing! Today we made fish stock with the bones and we have the beginnings of a bag of small pieces for chowder in the freezer. 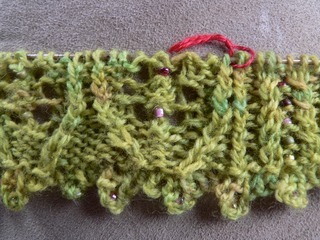 As to knitting -- well, Eve's Temptation is now in version 4. I realized I was being too literal with the patterns I chose so I went back and made changes to make it more allegorical. So far, I am happier with it. 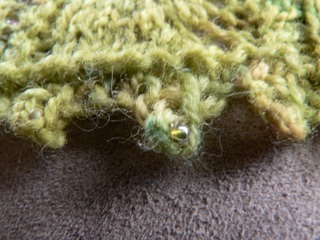 The beaded picot cast-on I fell in love with when I saw it on Romi's blog. The final design issue is the center. I know what I want and I have seen it in bobbin lace so the problem for me is to translate it into knitting. This could be interesting!